BRIGHOUSE Sports Bowling Club’s ladies section have recorded a notable success. The result of their Brighouse League Division Two match last Thursday evening saw them clinch promotion to the First Division of the League that incorporates teams from Cleckheaton, Heckmondwike, Ripponden, Spring Hall (Halifax), Bailiff Bridge, Rastrick and Hove Edge. Skipper Shirley Stow said it was a tense match, as their opponents, Bailiff Bridge A team, were a close second in the league tables at play-off. Shirley explained: “The end score was four winners each side with Bailiff Bridge having the aggregate. However, only two winners were needed for Brighouse Sports to become top of the league table in Division Two. “A special mention must be made to Helen Kettlewell, who gained the highest averages by not losing a single game all season with us. She is the daughter of Brighouse Sports Club’s A team captain Hedley Kettlewell. “Our other ladies team, captained by Hazel Garside, plays on Wednesday afternoons and that season does not end until the end of September. Shirley also made the point for ladies taking up the sport: “Afternoon matches offer sport for those at home during the day. “Although crown green bowling does not have a glamorous image among today’s many sporting options – and ladies do appear to like golf and tennis – it does, however, offer bending, stretching and walking exercises in the fresh air, the co-ordination development of eye and hand movements, competition and fun. “We are always looking for new players and offer a warm welcome and practice games. If interested contact Archbell@stows1.plus.com. Callum Wraight (Shrewsbury) and Ashley Daykin (Huddersfield) were the latest qualifiers in the £5,300 Brighouse Classic. Wraight beat Joe Stockdale and Stuart Hanson before beating Robbie Fitzpatrick (Wirral) 21-18 in the qualifying game. Daykin defeated Brian Lee and Steven Gilroy before a 21-11 success against Roy Nicholson (Halifax). This Friday evening at Brighouse Sports BC sees Gary Ellis (Whitefield) up against Craig Gant (Huddersfield) in the stand out first round game in a tough qualifying session. Full draw, 6.30 start: Ben Harris (Birmingham) v Kieren Clark (Barrow), Lee Johnstone (Warrington) v Andy Ferris (Leek), Paul Bowes (Pudsey) v Scott Tattersley (Huddersfield), Gary Ellis (Whitefield) v Craig Gant (Huddersfield), Dan Ferris (Leek) v Dave Penketh (Warrington), Ira Jeffers (Leeds) v Neil Simpson (Shipley), Paul Clark (Barrow) v Ashley Tattersley (Lower Hopton), Peter Grimston (Birmingham) v David Jackson (Macclesfield). Round One: Glynn Storer (Windmill BC, Staffs) 13, Wayne Ditchfield (Chorley) 21, John McDonnell (Manchester) 21, Natalie Hughes (Crossgates) 5; Gareth Gwilliam (Glossop) 21,Craig Gant (Netherton) 15; Malcolm Wensley (Clitheroe) 7, Gary Ellis (Whitefield) 21; Ben Gloag (Hyde) 21, Lee Cavil (Windmill BC, Staffs) 10; Steven Gilroy (Crossgates) 16, Michael McDonnell (Manchester) 21; David Gwilliam	(Glossop) 17, Liam Griffin (Pudsey BC) 21; Lex Wolfenden (Kirkheaton Con) 9, Simon Coupe	(Preston) 21. Round Two: Ditchfield 21, McDonnell 1; Gwilliam 20, Ellis 21; Gloag 21, McDonnell 5; Griffin 16, Coupe 21. Qualifying Round: Ditchfield 21, Ellis 20;Gloag 13,Coupe 21. Ditchfield drew ball 10 and Coupe drew ball 5 for the finals draw Sunday, September 20 (4pm). 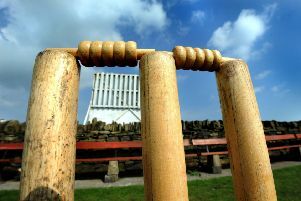 Field for Sunday, August 30 (play starts 5.30pm, practice from 4.30pm): Danny Radcliffe (Bradley & Colne), Josh Mordue (Pudsey), Chris Mordue (Pudsey), Terry Glover (Liverpool), Stephen Glover (Liverpool), Brian Hill (Chesterfield), Andy Spragg (Chesterfield), Jack Dyson (Netherton), Ashley Daykin (Netherton), Gareth Lally (Crossgates), Martin Gaut (Telford), Neil Simpson (Shipley),Tommy Johnstone (Poynton), Gordon Niven (Prestwich),Mark Hughes (Crossgates), Ira Jeffers (Crossgates). On Sunday, August 30 (2pm) at Cleckheaton Sports (Back Green), Moor Ends, Brighouse Sports play Lower Hopton in the final of the BCGA Yorkshire Cup. The draw is (with Lower Hopton players named first is): 1 Wilson v Bloomer, 2 Booth v Whitfield, 3 Seerah v Wormald, 4 Newton v Riley, 5 Ditchfield v Stansfield, 6 Brown v Regan, 7 Ingleby v Smyth, 8 Hirst v Mcorlick, 9 Hitchen v Hobson,10 Higgins v Kettlewell,11 Abdy v Foster, 12 Tattersley v Clarke.